When Stephen Williams played in Babe Ruth League, there was sometimes a familiar face behind the plate—Curly Clement. Williams was presented with the award on Wednesday night in Bourne. Nick Zibelli, president of the Collegiate Baseball Umpires Assigning Organization (CBUAO), said Williams shares a feel for situation handling with Clement. Zibelli recalled that Clement, affectionately known as the ‘Candy Man,’ would have his pockets stuffed with licorice and banana candy, and sometimes would put an end to disputes by offering up sweets. Williams didn’t produce any Twizzlers or Laffy Taffy on the field Wednesday, but his interactions with the catchers made it clear he’s gained a solid reputation. On-field personnel and general managers have input into the selection process, which Williams said makes the award all the more meaningful. 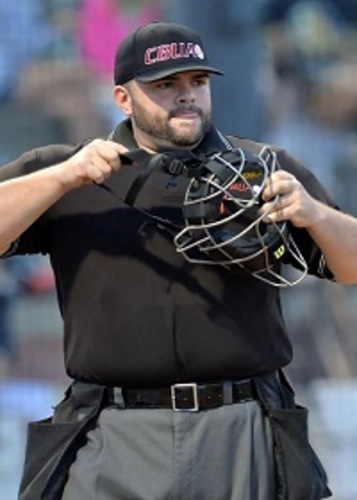 Williams, in his 16th year as an umpire and seventh season on the Cape, sports the look of a professional—from his emphatic point to the side to indicate strikes to his line of umpiring equipment. Cape League Director of Officiating Sol Yas, who umpires high school games himself, said Williams has come through the ranks quickly, in part thanks to how he interacts with others. “He’s enthusiastic. He’s always got a smile on his face. He’s got a great sense of humor, and I really enjoy being around him, as do his fellow umpires,” Yas said. Williams walked off the field Wednesday accepting plaudits from the fans still present in Bourne. As he neared the parking lot, he spotted some youngsters along the left field fence who stuck around to see the Braves wrap up a 13-4 win over Wareham. Williams reached into his ball bag and produced two souvenirs. For the kids, it was probably just as rewarding as a trip to the candy store. Clement is a Cape League Hall of Famer and worked as an umpire for over four decades in the league. His final Cape League assignment was home plate for the 2002 All Star Game. Clement passed away in 2006 after a long illness. Previous Clement Award winners include Mickey Garcia (2016), Rick Delvecchio (2015), Bill Fisher (2014), Pat Burns (2013), Joe Caraco (2012), Mark Ottavianelli (2011), Michael Sadowski (2010), John Leeds (2009), Harry Greer (2008), Tim Carey (2007), Peter Hall (2006), Jim McNally (2005) and Walter Bentson (2004).